If you are looking for a nice and funny gift for your friends, a gift which will be cherished and can be used in daily life by each friend, then you can get a personalized custom-made caricature featuring all of your friends which will be hand-drawn from regular photos on paper with colored pencils. Photolamus caricaturists can combine and create a professional caricature drawing where each of you will be depicted in full body type as dressed in a specific costume or simply in clothes from those photos. Any additional requirements should be mentioned and described below. 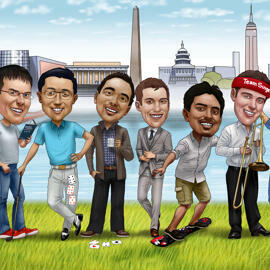 Usually, group caricature drawing take more than 5 days to get drawn by Photolamus. You will get a ready-to-be-printable JPG File of high resolution on Email. Caricature of Group of Friends can be shipped worldwide as Original Caricature Drawing Product, Printed Photo on Canvas, Photo Paper or Mug of the selected size.